Butler, Party of 4: Corn Rows....nice!! Our school is an avid supporter of Relay for Life, and tomorrow we are hosting our mini-relay here at school (operates sorta like a walk-a-thon....kids collect money in order to be able to walk). We raise money in our connection classes and compete against one another with rewards (like a jeans day) to fire them up. We even trash talk. Laura told her kids they better beat me & referred to me as "Barbie!" The kids think it's hysterical!! As of Wednesday, my yearbook class had brought in $0. Let me remind you the mini-relay is THIS Friday! So, to pump them up, I told them I'd wear corn rows in my hair (hahhaa, oh my gosh- how embarassing!!) if they could raise over $300 by Thursday. I didn't think they'd be able to do it. Most of them don't even know what corn rows are anyway, as one young lady thought they were called "corn rolls." So, guess what was waiting on me when I got into class this morning?? All of the collection envelopes with the total amount coming to...almost $1000!!!! What????? I honestly can't believe they did it...but I'm proud of them. It's for a GREAT cause!! Guess I'll have to be "ghetto Barbie!" 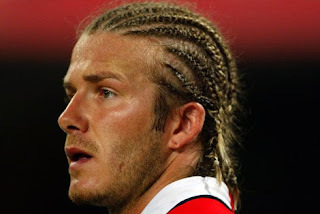 I'm thinking they'll probably look similar to ole David Beckham's since my hair is short now. Gross! Hahhaa, the mental image is crackin' me up right now! I think we will be adding you to the list of people who can pull off cornrows and still look pretty. So far the list includes Becks, Will Smith, and Bo Derreck. Way to get them going!